Afang Soup is a type of vegetable soup native to Southern Nigeria, specifically the Ibibio & Efik tribes across Akwa Ibom and Cross River State . It is a very delicious dish eaten by quite a number of Nigerians and even in some parts of Africa. While I was in the university, I had a room mate in my 3rd year who used to prepare it and that was how I got hooked on this dish. Afang soup is basically made from leaves; Okazi and Water Leaves with other rich ingredients. The Okazi leaf is botanically known as Gnetum Africana. It is a dark green climbing plant that grows wild in West African jungles close to the Congo Basin. However, it is harvested and cultivated for both subsistence and commercial needs. 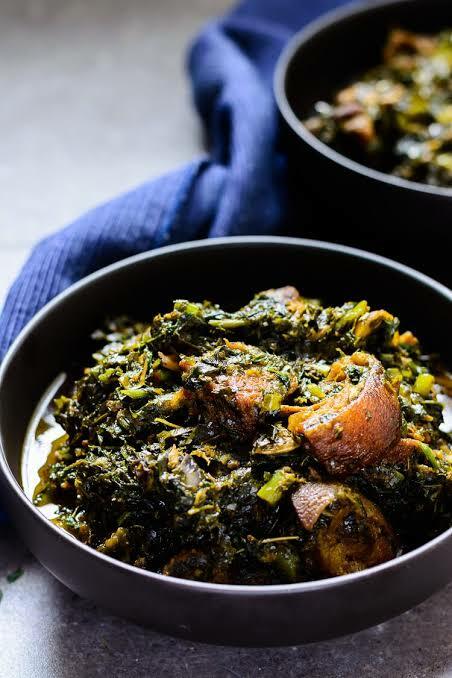 There is another popular soup native to the Imo and Abia people in Nigeria that makes use of Okazi leaves and is called Okazi soup, however, the preparation method differs. The ingredients used in preparing this dish include dried Okazi leaves, Water leaf also called Malabar Spinach, snails, clams, meat, stock fish, roasted fish, periwinkles, red onions, palm oil, scotch bonnet or habanero peppers, crayfish, cayenne pepper, stock cubes and salt. Water leaf could be replaced with regular spinach or any leaf with a high water content. It contains rich amounts of dietary fibre. Dietary fibre helps in bowel movement, prevention of constipation. It is also good for people on a weight loss diet because fibre keeps you fuller for longer. Water Leaf which is one of the main components of this soup helps in controlling blood sugar levels. This is because it slows down the breakdown, digestion and conversion of starch to simple sugar. Afang soup is a very good source of unsaturated fats known as HDLs (High Density Liproproteins). Although, there have been talks of avoiding cholesterol but HDLs are good types of cholesterol that helps in removing other bad forms of cholesterol like LDLs (Low Density Liproproteins) from the bloodstream. It is a rich source of Vitamin C which is a good boost for the immune system and helps its resistance against diseases and ailments like sores, sore throats and cold. Okazi leaves are very rich in Iodine and as a main component of this dish, you will be getting quite a substantial dose of Iodine which helps prevent goitre. The ingredients used in making Afang soup is very rich and contains lots of antioxidants. Antioxidants are super important because they help in fighting the effects of free radicals and prevention of oxidation. It could be used as an antidote for poison. The Afang seeds can even be used for wound dressings, controlling excess urination in kids and older people as well and as a stimulant for hair growth. Afang soup is good for pregnant women especially those who lack access to prenatal supplement as it is rich in folate and Vitamin A. It takes about 40 minutes to prepare this meal and one serving of Afang Soup contains as little as 307 Calories, 34% Calcium, 7% Vitamin A, 10% Vitamin C and 16% Iron. Afang soup is really very nutritious because of the combination of large amounts of vegetables, proteins, lipids and vitamins. You can enjoy Afang soup with cooked garri, wheat meal or fufu. 247healthblog.com comprises doctors, bloggers, medical marketers, volunteers and agencies who work together to help people live and stay healthy. We achieve these through writing and posting unique health tips. Next Ikokore- The Wonders of a Western Nigerian Food!